A Superman: American Alien #1 Review – Put Your Money Where Your Mouth Is! PENCILLERS: Nick Dragotta, Matthew Clark. Cover by Ryan Sook. 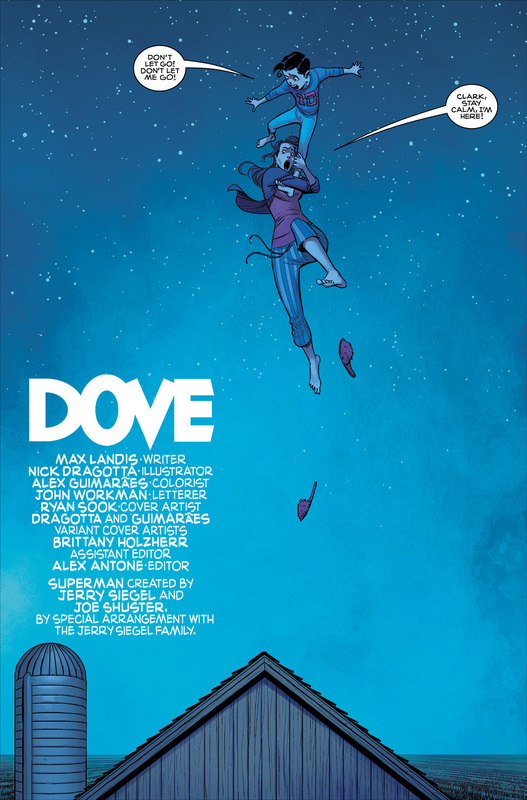 Superman: American Alien is a unique opportunity for Max Landis. He’s a renowned Superman critic who gets to put his money where his mouth is. But to comic book fans, Landis is perhaps best known as the man behind the short film The Death and Return of Superman, as well as a number of extended YouTube editorials (Regarding Clark, Death and Return of Superman Pitch By Max Landis, etc). While I haven’t agreed with everything he’s said, it’s tough to deny how knowledgeable he is about the art of storytelling. To their credit, DC saw that, and they started talking with him about doing a Superman story of his own. And to his credit, Landis eventually took them up on the offer, essentially agreeing to put his money where his mouth is. 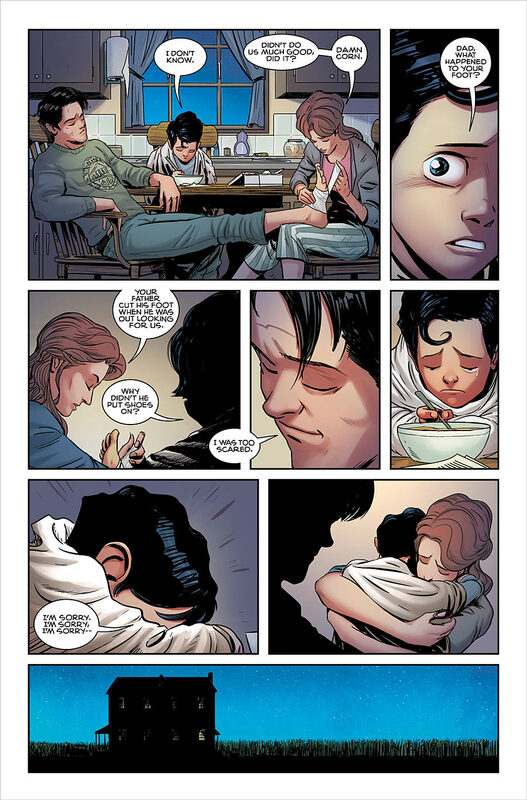 American Alien consists of seven short stories from the life of Clark Kent. This issue shows us an eight-year-old Clark and his parents coming to grips with his power of flight. In a brief Q&A that can be seen in the back of this issue, Landis said he was going for “heartwarming” with this first installment. Again, to his credit, he accomplished his goal. At the end of the issue, you’re smiling. At one point things get a little too silly for my taste, and at others Clark seems a little too wise for an eight-year-old. But by and large, the issue feels like something Pixar or Dreamworks might put out. That’s high praise, considering DC continues to struggle with making readers sympathetic to a character so powerful. They’re beating him down pretty hard right now, having exposed his identity and powered him down quite bit. But the right now the Superman books are largely lacking the emotional core you’d hope to find when Clark faces such dire circumstances. 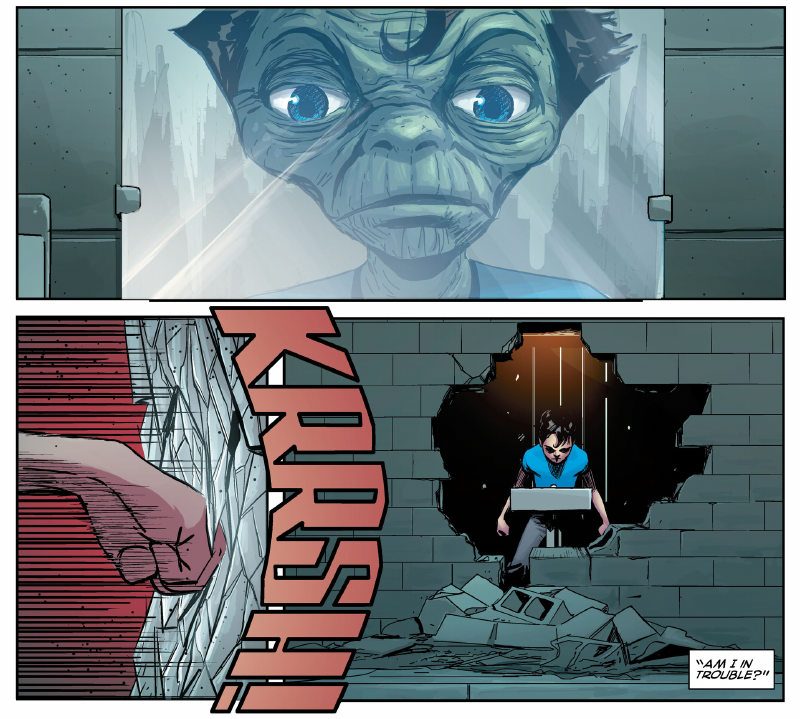 In contrast, there’s a lot of emotion in American Alien #1. Granted, it’s not all as complex in terms of Clark himself, as he’s just a child. But in just one issue we see the terror, frustration, shame, and ultimately excitement that this new ability brings him. Things are a bit more subdued in terms of the Kents. But we can definitely see them questioning their decisions as they struggle to raise this very unique child. However, there is one moment that nearly takes you out of the story. Clark has just had what we’ll call an “angry outburst,” and he’s driving home with his father. As they’re talking, Clark flat out says: “Dad…I’m so unhappy.” I question the notion of an eight-year-old being that conscious of his own overall happiness, much less being able to vocalize it so concisely. Even if the child in question is Superman. That’s not to say it’s impossible. I just found it odd coming from a child. On the plus-size, Nick Dragotta and colorist Alex Guimaraes very much deliver an aura akin to Clark’s idealized Kansas childhood. That opening shot of Ma Kent hanging off her young son’s leg (shown above) makes for an awesome hook. There’s also an excellent shot of young Clark looking in a mirror, and then suddenly seeing himself as a Yoda-like space alien (also above). Dragotta’s art very much makes this feel like an eight-year-old’s story, much as I’m sure Tommy Lee Edwards will give next issue’s fight story a certain hormone-enduced rough-and-tumble feel. At the end of the issue, we get a two-page spread that’s separate from the rest of the story. Drawn by Matthew Clark and titled “Castaways,” it’s simply a workbench covered in artifacts that belonged to the Kents. We see old photos, notes, newspaper clippings, etc. It sets the period well. If I’m not mistaken, we also see a clipped newspaper article about the car accident that killed them both. Certainly an ominous bit of foreshadowing. Max Landis and his cohorts may very well be bringing us a much-needed fresh perspective on Superman with American Alien. But I would argue it’s easier to do that with Clark Kent before he puts the cape on. Perhaps if Landis ever gets the chance to write Clark Kent as the Man of Steel, we’ll see just how good he really is. And as far as Superman stories are concerned, I think he has the potential (Key word: Potential.) to be very, very good. For more Superman, check out Lois and Clark #1, Superman #45, and Superman: The Men of Tomorrow. Image 1 from newsarama.com. Image 2 from kotaku.com. Image 3 from pastemagazine.com. 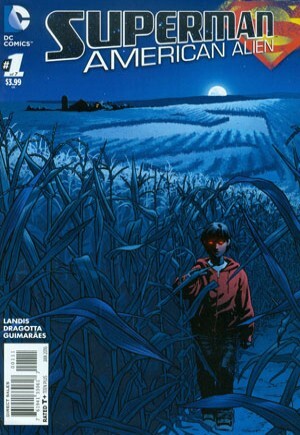 This entry was posted in Comic Books/Graphic Novels and tagged Alex Guimaraes, Clark Kent, comic book reviews, comic books, DC Comics, Jonathan Kent, Martha Kent, Matthew Clark, Max Landis, Nick Dragotta, Rob Siebert, Ryan Sook, single issue reviews, Superman, Superman: American Alien, Superman: American Alien #1 (2015) on 11/13/2015 by primaryignition.